Northern downy violet, our earliest wild violet, gets the "downy" in its name from its hairy oval leaves. The blue flowers have a "beard" on the side petals. Blue veins guide bees to the nectar at the back of the flower. May is the month for violets, and our earliest native wild violet overcomes challenging conditions at the beginning of the growing season to bloom in our woods in early May, or even late April. What most of us know of violets comes from enjoying them in our gardens and lawns a bit later in the month, but violets as a group are diverse and live in many different environments. Westborough has several wild violets, and our earliest one puts in its appearance in the often-cool, unpredictable weather of the New England spring. Northern downy violet (Viola fimbriatula, Viola sagittata var. ovata) is a small plant that takes advantage of the sunlight that reaches ground in woodlands in that special time of spring before the trees leaf out. Its blossoms are blue-purple, the color we usually associate with violets, although violets also come in white, yellow, and even green. Its blossoms have a contrasting white center, all the better to lead early bees and insects to the rich nectar deep in the spur at the back of the flower. Blue veins help to point the way for insects that land on the broad, convenient bottom petal, which they use as a landing pad. The leaves of northern downy violet are dark green and oval or arrow-shaped, not heart-shaped like the leaves of garden violets. For this reason, the plant is sometimes called arrowleaf violet. The leaves are also covered with hairs, which are the reason for "downy" in this violet's name. The hairs may help to protect the leaves from animals and insects that might want to chew on them at a time of year when not much else is green. That's not the end of this violet's hairiness. Like many violets, northern downy violet has a beard – hairs on the side petals of the flower. What's the benefit of a beard? It helps bees and other pollinators by giving them something to hold onto while they investigate the center of the flower. The beard also helps to keep out rain and dew, so the flower's rich nectar doesn't get diluted. Violets are said to be shy, perhaps partly because the flowers face down in cloudy or rainy weather and at night. This position also helps to protect their nectar from being diluted. Keep an eye out for northern downy violets in as you walk in Westborough's wooded trails. These violets often grow where the soil has broken edges, along trails or road cuts. Good places to look include the trails that lead from the parking lot at Bowman Street Conservation Area to the steep hillsides along the stream that flows into Sandra Pond. Check the uphill side of the bank next to the path just before you get to the stream. Or look along the trail that leads up to the top of Cedar Hill, just over the line in Northborough, off Westborough's Charm Bracelet trails. The clearing that's been done on the slope along the trail has created a favorable environment for northern downy violets. How do northern downy violets, and other violets for that matter, get their early start? One reason is that they are perennials with underground stems that store nutrients from the previous season. The plants draw on these stored nutrients in putting out their early leaves and blossoms. They have reserves that help them to survive if conditions are harsh in early spring – as often happens. Northern downy violet also deals with the uncertainties of spring blooming in a way that we aren't likely to notice. It actually blooms twice, producing two different kinds of flowers. The first kind is the familiar blue flower that attracts our notice at this time of year, and also attracts bees that go from flower to flower, cross-pollinating plants as they go. The second kind of flower comes later in the season, after the trees have leafed out and blocked out most sunlight from the forest floor. These flowers are tiny, green, and barely noticeable. They don't even look like flowers. Rather, they look like small, fat buds. They're usually hidden low on the plant, near the ground. These bud-like flowers never open. Instead of cross-pollination, there's self-pollination inside these closed flowers. Botanists even have a word for this type of flower that means "closed marriage" or "secret marriage." Both kinds of flowers - the showy, open flowers and the inconspicuous, closed flowers - produce seeds. The seeds from the tiny closed flowers do not have the genetic diversity of the seeds from the showy, bee-pollinated flowers, but at least they are seeds. This second round of flowers and seeds serves as the plant's insurance policy, or plan B, for times when spring conditions are harsh. If the weather is bad for showy flowers and pollinating insects - as it might be so far this spring – northern downy violet and other violets still have a way to produce seeds. 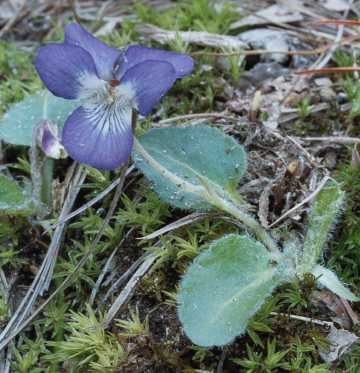 If you're lucky enough to spot a northern downy violet in bloom this month, think of the uncertainties it faces in the early growing season and the resources it has to overcome them.